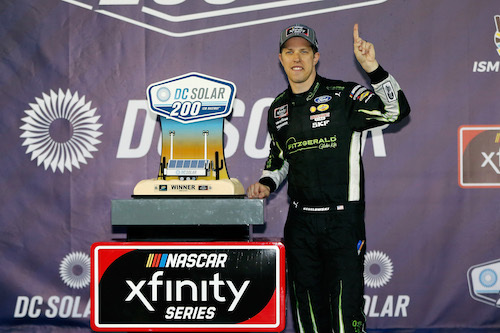 After two rain delays and a pit-road speeding penalty, Brad Keselowski was victorious in the DC Solar 200 NASCAR Xfinity Series race at ISM Raceway near Phoenix on Saturday. Justin Allgaier and Kyle Busch finished second and third. The top-three finishers combined to lead 181 of the 200-laps that made up the race, led by Allgaier’s 76 laps read. Keselowski led 66 laps, and after Allgaier started on the pole and Keselowski alongside on the front row, Allgaier and Keselowski combined to lead the total distance of the first 45-lap stage, with Allgaier taking the stage win. After the first delay for rain that came when the race was already under caution between the first two stages, the previous front-runners, also including Busch, were mired back in the field as a result of pit strategies, with some drivers pitting during an early-race caution for David Starr and others at the end of the first stage. Keselowski was farther back after his speeding penalty. By lap 62, though, Busch and Allgaier were in the top-two. When the yellow flag waved for Matt Mills just before lap 84, Allgaier and Keselowski pitted, while Busch retained his lead by staying out. Busch was still up front at the end of the second 45-lap stage after another brief red flag for rain. Busch pitted before the restart at the beginning of the final 110-lap stage of the race, handing the lead back over to Allgaier. Bell restarted second to Allgaier, but when the race returned to green, Keselowski took second, and then, the lead on lap 143. Christopher Bell took the lead from Keselowski just before final green-flag pit stops and was side-by-side with Keselowski getting out of the pits with 31 laps remaining. On lap 179, Keselowski took his final lead of the race. Bell finished fourth, and Jamie McMurray rounded out the top-five in his first Xfinity Series race since 2013. Other top-10 finishers included Daniel Hemric, Matt Tifft, Cole Custer, Elliott Sadler and Tyler Reddick.